Project: Cleaning of Joe Calzaghe Bridge. The pedestrian railway bridge had been constructed over 15 years ago. It has suffered heavy, contaminated build-up of unsightly green algae and moss. Crude graffiti has been painted along the side of the foot bridge. The foot way had become dangerous, is slippery and affects safe passage for pedestrians and school children going to and from the school and village. 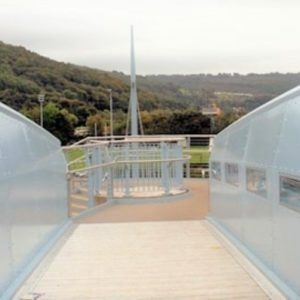 Caerphilly Council had previously used APT as their specialist commercial cleaning company to clean the main trunk road bridge and to remove graffiti from the roadway and railway bridge a few years earlier. The Calzaghe bridge however, was much more complicated and had very difficult access issues. The bridge ran over the busy railway line and a river crossing, it was also the main route for over 1000 children and pedestrians using the local swimming pool and school. 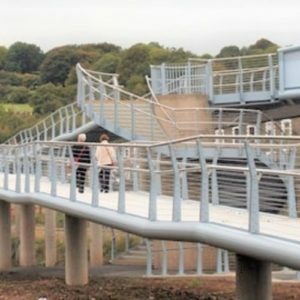 Because APT have over 25 years of experience in commercial high-level bridge cleaning, we could effectively and safely apply our tested methodology using specialist high level cleaning equipment combined with our specialist cleaning products to provide an acceptable safe system of works whilst the bridge was still in operation. We carried out the project working around busy periods with safe pedestrian and management in place. We used our rope access and high-level commercial cleaning teams for the highest points of the bridge which were over 20 meters high. A very successful result which exceeded the client’s expectations. Both the Council and local residents commented on how the improvement had made a huge difference to the overall look of the area. 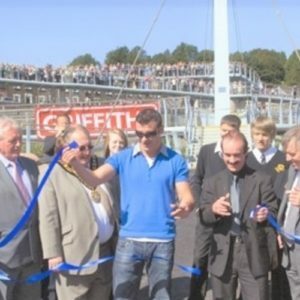 Another great job completed on the Joe Calzaghe Bridge, it looks as good as new! Thank you to all the team in managing the job with this very difficult structure”.